Jacqueline Diaz’s holiday wish has come true! The 37-year old woman from Chicago’s Pilsen neighborhood recently won $50,000 in Jewel-Osco’s Wish Big Win Big Holiday Giveaway Collect and Win Game. Diaz (center) was recognized during a presentation Thursday, Nov. 17, at the Jewel-Osco at 1220 S. Ashland Ave., in Chicago, where she earned her winning tickets. 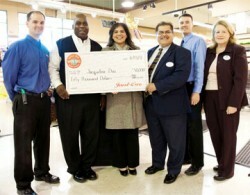 Pictured with her, from left, are Robert Jahnke, Jewel assistant store director; Frank Anderson, JEWEL-OSCO store director; Steve DeSantiago, Jewel-Osco district manager; Michael Kulikauskas, OSCO assistant store director; and Sheila Creghin, Jewel-Osco vice president of sales support. Diaz, a mother of a nine-month-old son, works full time and is also working on a master’s degree in nursing. She hasn’t yet decided how she will spend all of her prize money, but she says she plans to set aside some of it for her son’s education. During the Wish Big Win Big Holiday Giveaway, going on now at all JEWEL-OSCO stores, customers can collect game pieces for a chance to win their share of more than $30 million in prizes and money-saving offers, including two $250,000 cash prizes. Consumers can earn game pieces through Feb. 1, 2012, while supplies last. Visit www.jewelosco.com/wishbig for more information about the contest.